expert on the subject, in this case, the British Woodworking Federation. For further information, visit www.bwf.org.uk. Does the project require a fire door? Are the doors marked as certified? Is the hardware certified and CE-marked? Have the doors been modified since they were certified? Have you fitted the doors correctly? 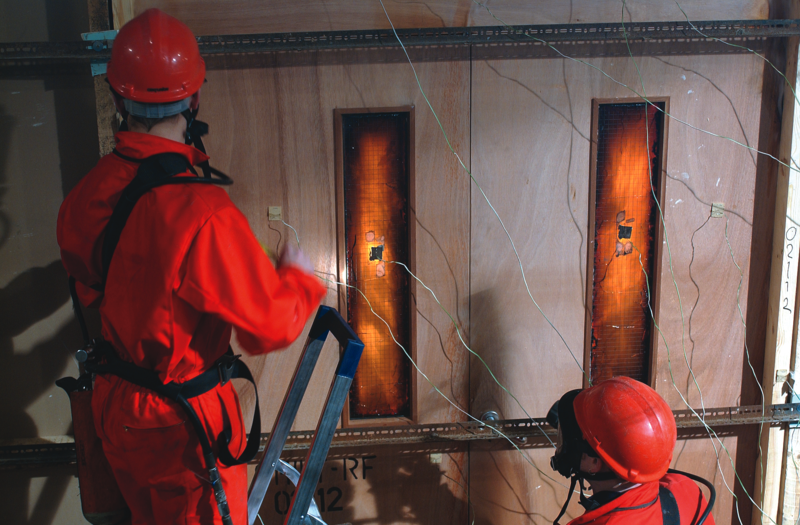 A fire door has been tested to withstand fire and/or smoke for a specific period of time. It has an intumescent seal designed to expand to fill the gap between the door and the frame. A doorset package includes the door leaf, frame, hardware, intumescent seals and smoke seals. Each component plays a critical role in the doorset’s fire resistance. Changes from the tested specification should only be made with the approval of an appropriate expert authority, such as a UKAS-accredited testing laboratory. Correct installation of fire doorsets, using compatible fixings and methods is critical to performance in a fire. What are the regulations for new buildings? Building Regs (Approved Document B in England and Wales) specify the requirements for doorsets to protect occupants for a minimum time in different locations in the building. Volume 1 covers domestic houses; Volume 2, all other buildings. Some buildings, or insurance requirements, may require doorsets giving 90 or 120 mins’ performance. Where Building Regs refer to FD20 doors, use FD30 doors for added protection. 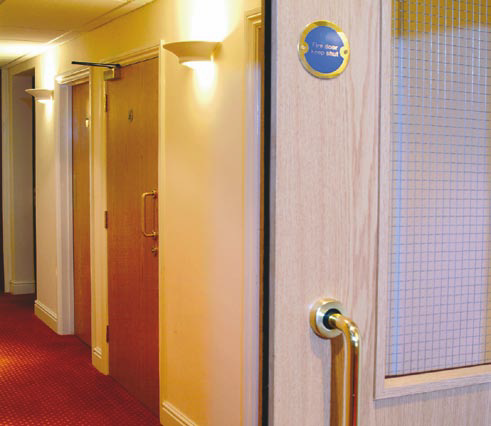 When is a fire door needed? 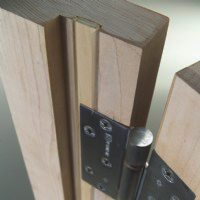 We recommend specifying certified doorsets for all building projects. An increasing number of companies are building products covered by a third party certification scheme into their building specifications so as to provide information about specification and product performance. In addition, major insurers often insist on third party certificated products. Use fire-resisting doorsets, rather than single ‘fire door’ leaves. A doorset package includes the door leaf, frame, hardware, intumescent seals and smoke seals. Each component plays a critical role in the doorset’s fire resistance. Changes from the tested specification should only be made with the approval of an appropriate expert authority, such as a UKAS accredited testing laboratory. Correct installation of fire doorsets, using compatible fixings and methods, is critical to performance in a fire, and certification is void if the specifications are changed. Fire doors are life-critical. So it makes sense to use certified product. 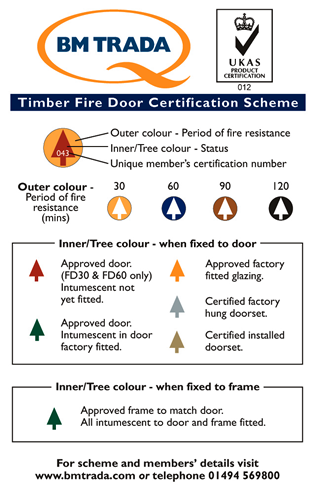 Certification schemes, like the BWF-CERTIFIRE Fire Door and Doorset Scheme and BM TRADA’s Q-Mark Fire Door Scheme, ensure doorsets are fit for purpose. Certified doors leave the factory with clear identification – a label or permanent plug in the door edge. This makes them recognizable as compliant, quality products, traceable for building control approval and any future fire risk assessments. Correct installation of fire doorsets, using compatible fixings and methods, is critical to performance in a fire, as certification is void if the specifications are changed. Doorsets: the door comes hung in its frame, complete with all essential hardware and seals. Door kits: the door and frame are sold factory-prepared and ready for hanging, complete with compatible components. Door leaves: leaves may be supplied unfinished, veneered or painted, and must be matched with the correct size frame and compatible components. Door blanks: oversized, unfinished leaves to be trimmed to size, lipped and veneered. They must carry evidence of performance once converted to a doorset. Their specification must match the approval, including manufacturing and all components. Check all hardware has test evidence to demonstrate fitness for purpose – only hardware listed on the fire door certificate should be used on a fire door. Fit according to the manufacturer’s specifications, using intumescent gaskets and seals as necessary. DO NOT cut glazed apertures, or openings, yourself as this will invalidate the fire certificate. This must be performed by a licensed company. These expand with heat, providing a fire stop and thermal insulation. As their expansion properties vary, the type, size and installation must remain exactly as tested for the end use application. Seals are fitted around the perimeter of the frame or in the edge of the door leaf, to seal the gap between leaf and frame in a fire. Intumescent paper or mastic gaskets are often necessary between ironmongery and timber door components. Ensure seals of the right size and material are fitted in the correct locations as indicated by the fire door manufacturer. Fire doors that need a glazed aperture, or different aperture, should be supplied straight from the certificated supplier. Fire doors must not be glazed on site – this will invalidate certification. Wired glass is no longer the only option for FD30 and FD60 doorsets; many systems and glass types are available. The compatible glazing systems relevant to the specific door will be detailed on the fire door certificate. Make sure the door leaf is square in the frame, with an even gap of 2–4mm around the sides and top edge. Set the threshold gap at the bottom edge according to the manufacturer’s specification. Smoke sealing requirements for the doorset may also dictate the size of gap under the door. In the absence of a threshold seal, set a gap of 3mm. Some fire door leaves permit limited trimming during installation. Only trim within the allowance stated on the fire door certificate. Identification marks or labels should not be damaged during resizing. Double leaf doorsets with rebated meeting edges must have supporting test evidence as detailed on the fire door certificate. Intumescent protection and ironmongery can differ from a single door, so always check the fire door certificate to ensure compatible materials and specification. A fire-resisting doorset is an engineered safety device. Any alterations, such as adding glazing apertures, should only be carried out by an approved manufacturer or installer. Do not carry out this work on site as unauthorised alterations to fire door components usually invalidate the certification. As with any safety device, a fire-resisting doorset and all its components should be checked and maintained on a regular basis (Article 17 of the Regulatory Reform Fire Safety Order 2005 requires that fire safety equipment and devices are maintained in an efficient state, in efficient working order and in good repair). Any replacement components should match those originally fitted and be fit for purpose. If the door has to be replaced, it must comply with the appropriate Building Regulations. Failure to do so can place property and lives at risk and is likely to result in criminal prosecution. The dangers of buying and installing non-certified doors and doorsets and/or the wrong components are obvious. Failure of the door or doorset is likely to occur, putting people and property at risk and resulting in possible prosecution for the manufacturer, supplier and installer. Strength-Grading Wood or uPVC windows?